Leasing activity in Tampa Bay’s industrial market increased significantly during the second quarter, setting the expectation for a higher volume of closed transactions in the third and fourth quarters. As uncertainty and apprehension about the macroeconomic forecast began to calm, business owners demonstrated willingness to make real estate decisions. 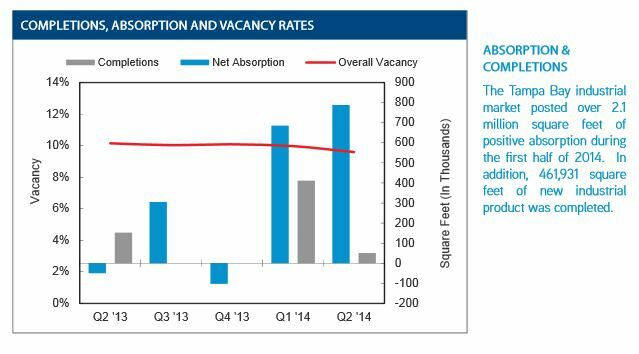 It is worth noting that vacancy rates published in this report do not give a clear indicator of how much usable space is available. Many industrial properties in Tampa Bay are outdated or have become functionally obsolete, and therefore may never be leased in their current conditions. So while vacancy rates may indicate there is still industrial inventory available in the market, tenants and buyers are, in reality, having difficulty finding space that works for their business needs. Tampa Bay’s industrial market experienced a significant increase in activity during the second quarter, setting an expectation of higher closed transaction volume in the third and fourth quarters. Over the past several quarters, vacancy rates had not moved significantly; however, in the second quarter there was a notable dip to 9.6%, from 10% in the first quarter. The Polk County submarket, where 1 million square feet of industrial space is currently under construction for one of two area Amazon distribution centers, experienced the most absorption during the second quarter, with 461,009 square feet absorbed. Interest in smaller industrial properties – those in the 10,000- to 40,000-square-foot range – picked up substantially in Tampa Bay during the second quarter. In Pinellas County, industrial demand for both sale and lease transactions increased significantly, with some large tenants in that area seeking to expand. In addition, Tampa’s Airport submarket saw existing tenants expand, and the East Tampa submarket was active, particularly for user sales where limited product was available for sale. In Tampa Bay’s industrial market during the second quarter, market-wide lease rates were up slightly, while lease rates for smaller users – 10,000 to 20,000 square feet – remained flat. During the second quarter, the overall average asking rental rate for industrial product remained consistent with the previous quarter, while rates for flex product increased from $7.36 to $7.54 per square foot. Meanwhile, concessions remained similar to the first quarter, with many landlords offering one month of free rent per year of the lease. In addition, tenant improvement allowances dwindled during the second quarter, with owners preferring to give free rent instead. Construction trades and building supply tenants were active in Tampa Bay’s industrial market during the second quarter, as were chemical companies, small and/or local manufacturers, and consumer goods distributors. 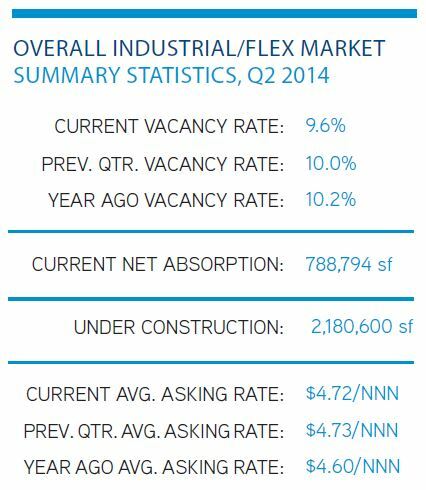 In addition, medical device manufacturer tenants were expanding, particularly in Pinellas County’s flex market. In Tampa Bay, investment demand for industrial space was very high during the second quarter, especially for newer Class A properties; however, there was very little product available on the market. Industrial owners are eager to lease up properties and push rental rates higher before putting properties on the market for sale. Investment demand continues from all types of investors: local, regional, national, institutional and foreign buyers. During the second quarter, interest rates held steady or dipped slightly, which fueled investor demand further. For industrial users, financing opportunities were improved but remained difficult to secure in the second quarter. And, as has been the case in recent quarters, very little distressed industrial assets are in lenders’ pipelines. During the second quarter, construction was completed on Building 700 in Interstate Commerce Park in Polk County. The 50,400-square-foot manufacturing and distribution warehouse at 4100 Frontage Road S in Lakeland is fully leased to Brew Hub, LLC. Brew Hub’s business model allows craft brewers to partner with the company and brew their beers onsite, and then have the beer packaged and distributed using the Brew Hub distribution system.